2117. Witty's smoke-consuming furnace. The advantage of this furnace is, that all the fresh coal supplied to it is carbonised by the heat from the burning coke or carbonised coal below; the gas disengaged from the coal by the process of carbonisation being also inflamed by the heat. The coal is thus, instead of being burned in a crude state, subjected to carbonisation previously to combustion, and consequently does not produce smoke. In fig. 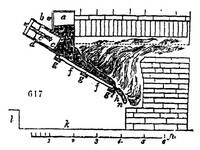 617., which is a section of the furnace, a is the hopper, into which slack, or refuse coal, is put through the door (b); d is an oblong square box the width of the furnace, fitted with a screw and cross-bar, by which the pusher or presser (c c) is moved backwards and forwards at pleasure, in order to let the coals down from the hopper, or to advance them forward down the inclined plane (f f) which is made of fine tile supported by cross-bearing bars (g g). The grate (h) swings on its centre (i), which may be placed at the most convenient angle, and supported by a brick placed in the opening at n, which serves for clearing out the ashes and clinkers, when required; k is the ash-pit, and l, the steps leading to it.